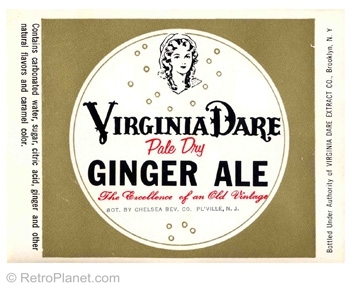 This label from the 1950s is for Virginia Dare brand Pale Dry Ginger Ale, one of the many products produced by the Virginia Dare Extract Company of Brooklyn, New York. They started out in 1835 as Garret & Company, makers of Virginia Dare wine. In 1919, due to Prohibition, they turned to the production of other food products, and began to manufacture flavor extracts under the Virginia Dare brand name. The Virginia Dare Extract Company was incorporated in 1923. Today, in addition to flavor extracts, the company produces sweetness modifiers, flavor enhancers and food colors. Virginia Dare was the name of the first English child born in Sir Walter Raleigh’s Roanoke Colony, which was founded off the coast of modern-day North Carolina the same year (1587). The colony soon disappeared and all of the settlers were believed to have perished. But a legend lives on that Virginia Dare lived to marry a tribal chief. Another story claims she was mistaken for a white doe and died after being shot with a silver arrow. Whatever the real story is, Virginia Dare lives on as a symbol of purity and wholesomeness. Produced by: Virginia Dare Extract Co.